Find out if wallpaper can be feasible in the most splash-prone zone of the home. Q: My wife wants to hang wallpaper in our Jack-and-Jill bathroom. The walls could do with some eye candy, but how well will wallpaper hold up in the bath? A: Given the walloping that bathrooms take from water and steam, hardier materials like glass or marble tile are more durable choices than traditional cellulose-based wallpaper. And wallpaper also invites a potential health issue, should mold develop behind the pretty surface. But wallpaper has its merits—and it can be viable if you’re prepared to work around its drawbacks. Read on for the pros and cons of wallpapering the bath so you can decide if this décor idea is right for you. Moisture can cause wallpaper to peel. Traditional cellulose-based wallpaper isn’t designed to fend off the water droplets and steam kicked up regularly by the tub and/or shower. Moisture and humidity can seep through to weaken the paste that bonds the material to the wall. 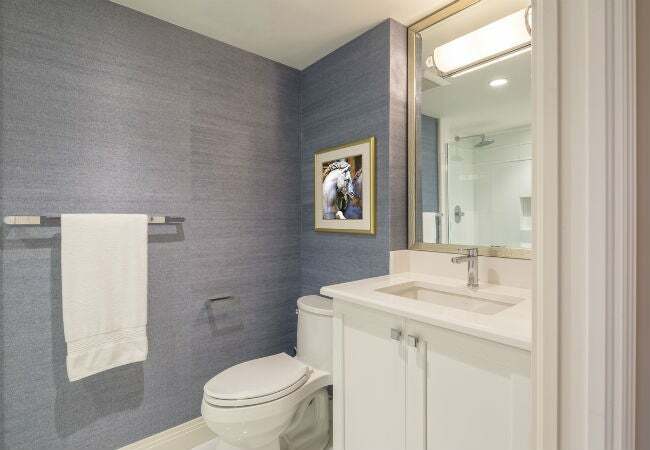 Once the adhesive starts to fail, any wallpaper in the bathroom will usually start to curl up from the seams between pieces or the top edge of the baseboards—and this is bound to continue in larger swaths until the only remedy is a partial or full wallpaper replacement. Plumbing problems can lead to wallpaper stains. 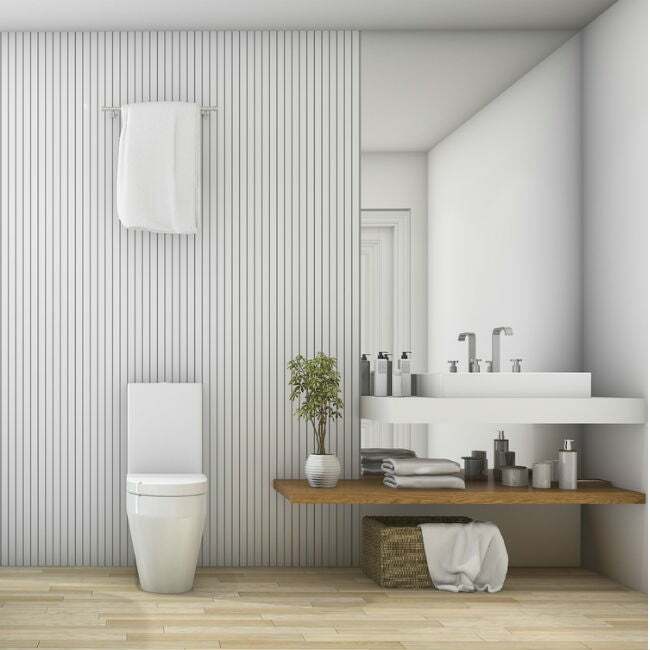 Most homeowners will confront a burst pipe, overflowing toilet, or faulty faucet at some point, and should spillage mar your wallpaper in the bathroom, it can leave a water stain—usually in the form of a gray ring or splotch. If water seeps all the way through to a wood foundation wall, the tannins (pigmented compounds) in the wood can leech out and transfer to the wallpaper as a yellow or brown stain. Mold thrives behind wet wallpaper. The moist and dark environment behind wet bathroom wallpaper is ideal for mold growth. Some molds commonly found behind wallpaper, such as Aureobasidium, can cause skin irritation or infections, while toxigenic molds such as Fusarium can cause abscesses or even bone infections. The worst part is that you usually won’t see the mold until you peel back the wallpaper, so it’s possible for mold to quietly spread into a full-on colony without your knowledge. At this point, the wallpaper would need to be removed, and, as recommended by the U.S. Environmental Protection Agency, a mold remediation specialist should be consulted to deal with the problem if the area of mold growth exceeds 10 square feet. Note: The potential for mold growth is the reason to avoid installing wallpaper in bathrooms if your home has rising damp (caused by groundwater moving through masonry and up walls) or penetrating damp (caused by water leaking through walls because of cracks or other structural problems) conditions. Decaying baseboards and water stains that rise up to three feet above the baseboard are telltale signs of rising damp, while persistent blotches of dampness on walls are more indicative of penetrating damp. Wallpaper easily brings pattern and texture. It’s time-consuming to stencil a basic pattern onto a wall with paint or texture a wall with drywall compound, and the quality of the results will depend on your finesse with a paintbrush or a trowel. Wallpaper, however, comes in a printed spectrum of vivid colors, interesting patterns, and rich textures, and a DIYer will find it relatively simple to hang patterned or textured wallpaper. You can mimic high-end materials for less. Granite tile goes for $3.50 to $7 per square foot in, marble tile runs $5 to $50 per square foot, and glass mosaic costs $6 to $30 per square foot. If these luxurious materials aren’t within your budget, wallpaper designed to look like them—which starts at $0.58 per square foot and is sold in a variety of colors—is an artful, inexpensive alternative. • Choose solid vinyl, fabric-backed vinyl, or paper-backed vinyl wallpaper; these scrubbable and strippable (i.e., designed for easy removal) wall coverings are highly resistant to moisture and humidity. • Apply a mold-proof wallpaper primer to the wall before wallpaper paste to create a smooth surface for the wallpaper and keep the wall from absorbing the paste. • Use mold-proof wallpaper paste, and apply extra paste underneath any areas of wallpaper near a shower. • Apply a clear acrylic varnish over the installed wallpaper to boost its resistance to moisture and heat. This will also lessen the chances of the wallpaper becoming permanently stained. • Install the best bathroom fan and run it while showers or tubs are in use to keep water vapor from settling on and seeping into wallpaper. • Leave the bathroom door and/or windows open during and after bathing to let the steam escape whenever possible. • Eliminate dust and light debris accumulations from the wallpaper on a weekly or biweekly basis with an extensible hand duster. • Wash the walls regularly with a soft sponge dampened in a solution of two tablespoons clear dish soap and three cups of warm water (or the cleaner recommended on the wallpaper packaging). Move the sponge in the direction of the wallpaper seam (usually up and down) and dry thoroughly with a microfiber cloth.